Episodes in my Life: Does anyone still darn? When I was eleven, I was sent to Boarding School, a horrific experience which I try not to think about, but there was one thing I learnt which has proved really useful, and that was Sewing. 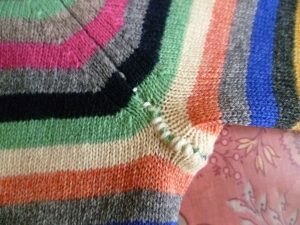 We only did it for one year, but it covered all the basics, including darning. It’s now winter and I feel the cold. I have several jumpers and cardigans which I rely on to keep me warm. I’ve had them for years and I love them all but they are beginning to show their age and holes are beginning to appear. My darning skills are needed! 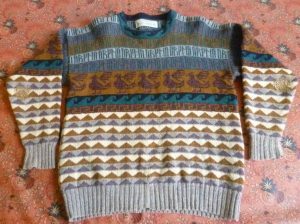 Take my Orkney jumper. My mother bought it for me when we visited Judith Glue’s shop in Kirkwall in the Orkneys in 1996. It has five rows of runes along the top, which read ‘Orkney’, a row of Pictish birds underneath, then a row of stylized waves, followed by rows of triangles in browns and greys. It’s incredibly warm. Judith Glue lives and works in the Orkneys, and mine is one of her runic designs. Unfortunately, as you can see, holes developed at the elbows and I’ve had to darn them. They are not perfect but at least they tone in with the pattern – well, that’s what I tell myself. 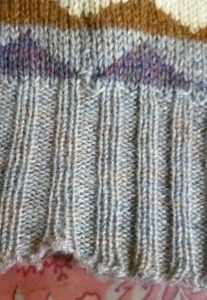 Then I noticed that moths had nibbled at the bottom of the ribbing at the front. 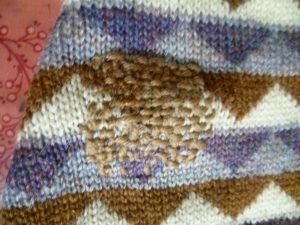 I’ve over sewn it and mended a tiny hole in between the two heather-coloured triangles. There were at least six tiny moth-holes which are too small to darn. Fortunately, Shetland wool is thick and I’m hoping my repairs don’t show. 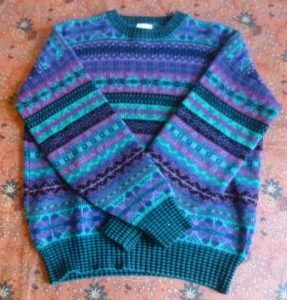 I’ve had my Wendy Lawrence jumper which for at least twenty years – I bought it in a Charity shop in Harlech in Wales for £5. It’s a thing of beauty and I can’t imagine how anyone would want to get rid of it. I absolutely love it and it even warmer than the Orkney jumper. It’s so thick that, so far, it doesn’t need darning. But it’s beginning to come apart at the seams. You can see – just – where I’ve over sewn the arm seam with thick black wool. I love this cardigan, too. It’s 100% lambs’ wool and not as heavy as the two jumpers. The sleeves are three-quarter length and I wish the cardigan was an inch or so longer but it’s still a very useful garment as it goes with almost anything. However, both elbows developed holes which I’ve repaired by cutting a large suede patch in half, cutting out a suitably-sized template and creating two patches, one for each elbow. I’ve folded one sleeve over for the photo so that you can see that, from the front, the patches don’t show at all – probably just as well! 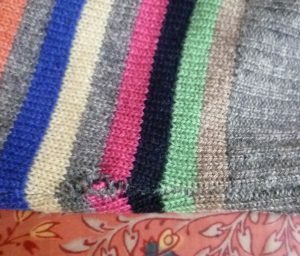 It, too, is beginning to come apart at the seams and I’ve had to over sew where the underarm sleeve meets the rest of the cardigan. It’s an awkward place and I chose cream wool on purpose so that I could see exactly what I was sewing. Fortunately, I don’t go around with my arms raised so it doesn’t show. I’ve been keeping my eye on Gap’s new season cardigans but unfortunately, at the moment, they are going in for sparkly stripes and too many colours with yellow in them, neither of which suit me. So I’m using such sewing skills as I have and hoping that fashion will move on. 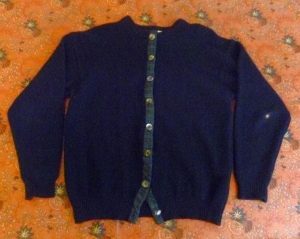 Lastly, there’s my 100% lambs’ wool navy cardigan which I bought in Fort William. Again, it’s very warm and I wear it a lot in winter. However, I’ve recently noticed a hole in one of the sleeves (I’ve put a bit of card inside the sleeve so that you can see it), and the other sleeve is also thinning at the elbow. They will have to be darned. I went into my local department store which has a small haberdashery compartment and said to the girl at the counter, ‘I’m looking for navy darning wool.’ She looked bewildered. ‘What’s darning wool?’ I explained but it was obvious that she didn’t really know what I meant. I eventually found some but I felt like a relic of a long-vanished past. Am I the only person who still darns? The garments look huge in the photos, I don’t know why. They are all size M.
10 Responses to Episodes in my Life: Does anyone still darn? I do darn and mend, but I was never taught how to. 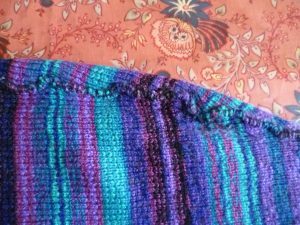 I tend to go by instinct, following the loops of the knitting when elbows start to wear thin. It is a curiously soothing thing, and also appeals to my inherent parsimony and loyalty towards garments! I love your ‘loyalty towards your garments’, Jan. It made me smile but I know exactly what you mean. Yes, I learned to darn. I doubt you can buy a mushroom now. I’ve got two – not actually mine, but replicas from my mum’s old shop. Reluctant to get rid of them, though I doubt I’ll do any darning. I’m rubbish at repairs. I can do them, but the thing has to be practically falling apart before I get to it. I don’t think I cherish any old jumpers now. I did have aged ones, but they’ve all gone by the wayside. Ballet shoes. 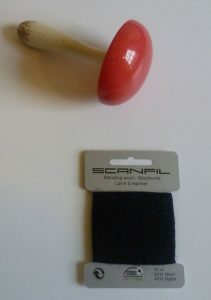 Every ballet dancer has to darn. I had pointe shoes once, but couldn’t do pointe as I’ve got a long big toe, so sadly never actually darned the blocks! Thank you for your comment, Elizabeth. I also know about the art of procrastination when it comes to mending. I remember lamenting to my teenage son that I’d taken so long to do a darn that it was now about twice as big. ‘Oh well, he said,’ philosophically, ‘it’s nine stitches in time saves eighty-one.’ He was so right. My mother taught me to darn. I don’t do it a lot, now, but it is a useful. It wasn’t something we were taught at school, although I was far too frightened of the needlework teacher to learn anything from her! Thank you for joining the conversation, Melinda. I love colourful cardigans and jumpers, especially in winter. I once won a session with a makeover outfit called ‘First Impressions’ in a competition, and very useful it was. I’m a winter person. ‘Think Ice’, she said. I should avoid muted colours and anything yellowy. She was right – a pity, though, I’ve always longed to wear a peach satin underwear set! But, alas, the colour makes me look bilious. I was taught darning, as well as dress-making, by my mother who was of the war-time “make-do and mend” generation. I’ve found it very useful. Like you I love my sweaters and want them to have a long life. Some of the lighter weight sweaters I’ve bought recently include a small card with a useful length of the yarn they are made from. That makes a darn so much more inconspicuous – if one can find the yarn when it is needed. Thank you for your comment, Pauline. So true about the yarn! Extra buttons are useful, too. How nice to hear from you, Anne. 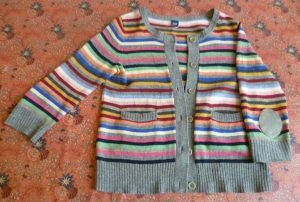 I’m delighted Judith Glue jumpers are still making her customers happy and warm! If I ever found myself back in the Orkneys, her shop would be on my ‘must re-visit’ list, along with the Stone Age village of Skara Brae and the tomb of Maes Howe. And, as the last two are in windswept locations, Judith Glue’s shop with its warm jumpers would probably come top of the list!